Hey Everybody! A few weeks ago I asked you if you'd like to see a little bit of my home and do a bit of a tour...so I'm starting off the tour with our bathroom renovation (which isn't really finished yet). We did this little remodel ourselves, on the weekends etc. When we moved in this is how the bathroom looked (left pic). 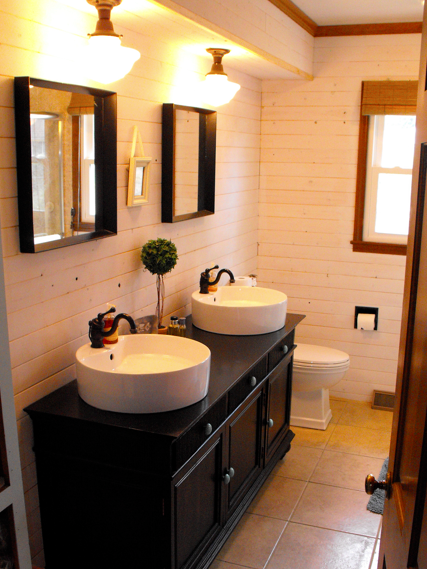 One sink and a small vanity area. 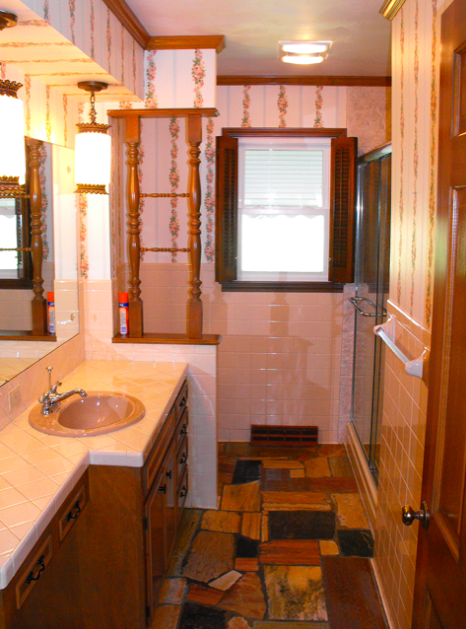 Glazed stone/marble floors and oatmeal colored tile...ugh. To change up the space we used a buffet we already owned and purchased two sinks online at $80 a piece. It was difficult finding faucets to fit the sinks, but we were able to make these from Amazon work. I tiled right over the marble floors with large 12 inch tiles from Home Depot (around 85 cents each). We splurged on a "square" low flow toilet and school house lighting. After we ripped out the tile we saved time and energy by cladding the walls in strips of pine so it looks a bit barn-like. This is super affordable...about $40 for all the walls. We then primed the wood and have yet to paint it white. The square mirrors were purchased on clearance at Target (I think they're actually trays) for $12.99 (reg. $50). To completely finish this space I still would like to stain all the wood trim darker to match the vanity base (which is not black, but dark espresso), add baseboards all around and make a threshold piece to fill the gap between the tile and the wood floors in the hallway, and change out the shower door to oil rubbed bronze instead of the nickel. For more photos of our remodeling projects click over to Different Dog's Cottage. That looks great! I absolutely love the sinks. Great choice. Hi your bathroom look really nice - love the sink! Wow! You guys have transformed that space!!! Way to go! Wow! You did a lot with not very much...looks great! Looks amazing! What a transformation! That is an amazing job you did there! I am so in love with those sinks and faucets, hmmm I wonder if DH would like to go shopping? LOL! looks awesome! i especially love the lights that you chose!